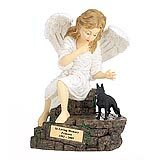 "Looking at the Angel, without tears finally, but with warmth as nearly 14 years of wonderful memoiries in my heart and mind, even the last seven days were easier to recall as I looked at ther now with her favoirte ball in the grass with the loving touch of the angel over her. 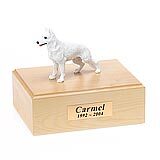 That picture was taken just five months and a few days before we had to part--to look at the picture you would never guess her age and that she would be gone so soon. 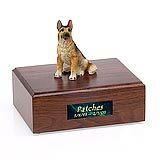 So the urn is pefect for Goldi and for me it gives me some peace to know that she now has a special place fo her own again, just as always will in my heart, just our home. 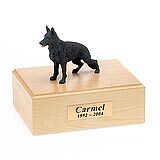 And there she will be until my time comes and our ashes mixed and we once again can sail on the water together. 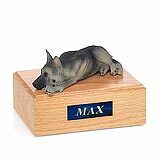 Thank you, I would be more than happy to send a letter if you like as a referral of some sort if you would like. 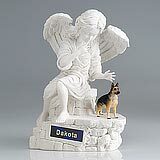 Most of my "dog friends" think it is wonderful -- I have given them your web link." 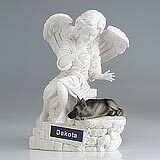 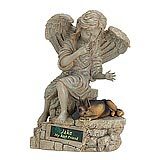 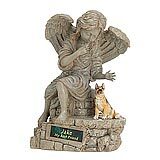 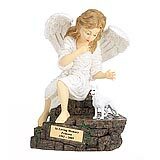 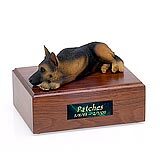 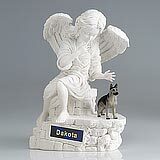 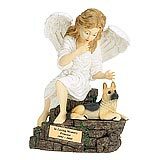 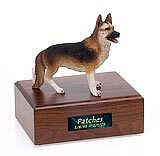 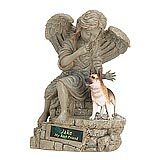 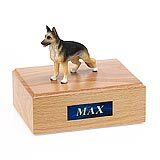 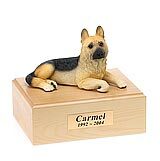 All available German Shepherd dog urns and memorials will be displayed with the figurine on the German Shepherd urn you select and in the appropriate size.